High Ticket Closer By Dan Lok - Review - Is It Legit? If you're reading this High Ticket Closer review, then I'm guessing you've recently heard about Dan Lok's new system and you're wondering, is it a scam? Or is this actually a legit way to make money online? Well, with all of the hype this has been getting lately, I wouldn't be surprised if you had some questions. In this review, I'm going to be answering them all! High Ticket Closer Review – What Is It? First off, before we get started talking about High Ticket Closer, I'd just like to mention that I am not an affiliate for them. So this will be a completely unbiased review. 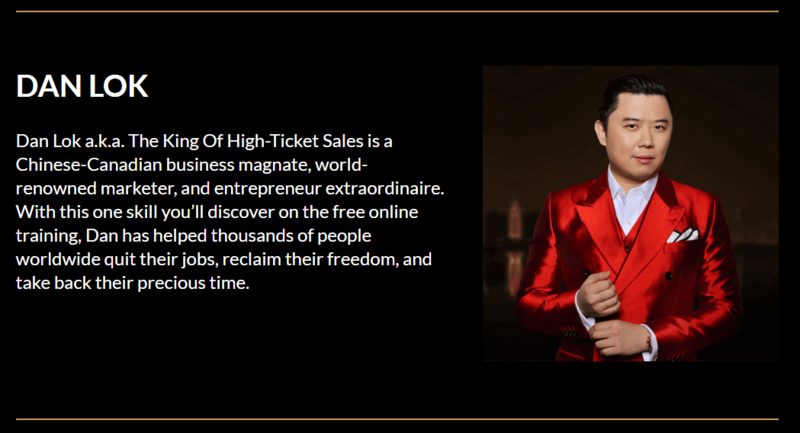 As I mentioned earlier, High Ticket Closer is a new online business opportunity by Dan Lok (I'll talk about him later), that has been getting a LOT of hype lately. A lot of people have been talking about it. But, not everything that's being said has been good. Some people are saying that it's legit and it's a great way to boost their businesses. However, on the other hand, some people are saying this is just another MLM scam. I want to find out who's actually right. The picture above is from the High Ticket Closer website. It's not something I made to big him up. He does also have a YouTube channel where he gives some genuinely great free content. So I'm sure if his free content is good, then his paid course will be really, really good. Dan Lok was originally from Hong Kong, but has since moved to Canada to live. When he first started this program, he only had 49 slots available. However, since the program became very popular, he's now added many more spots. What Is The High Ticket Closer Product? High Ticket Closer’s main product is a 7-week program that costs $2495. Which is quite a hefty price tag, as it is an actual high ticket offer. In those 7 weeks, Dan will teach you exactly how to promote and sell high ticket offers. He will teach you every single thing that you could possibly need to know. Dan will personally mentor you, and everyone else who joins up for those 7 weeks and will guide you every step of the way. And it's all done online, so you don't need to travel around. You can do everything from your computer. The program is actually very intensive. For the 7 weeks, it's going to require your full attention if you really want to get the full benefits from it. Although, it is $2495, so I imagine if you've paid that, you're definitely not going to be messing around and not giving it your attention. Understanding the mindset and psychology behind high ticket offers. Learn how to professionally handle rejection from potential clients and walk away with your head held high. Learn secrets of closing deals over the phone for millions of dollars by learning high ticket sales scripts. Where to find high ticket partners. The main focus of Dan's training is to get you to become a 6 figure earner. However, it doesn't stop there. He also teaches you and pushes you to go beyond that and become a 7 figure earner like he is. Not ridiculously high priced – $2495 might sound like a lot to some of you. But when it comes to online business training, it's not as high as a lot of the ones out there. You can pay in 3 instalments instead of 1 time upfront. You'll be working with some of the best entrepreneurs in the world. Dan will introduce you to some of his high ticket clients. The training definitely has the potential to allow you to become a 6/7 figure earner (if you put your mind to it). $2495 isn't cheap by any means. Some people might struggle to come up with this money. There are a lot of people in the training, so it might take Dan a long time to help you with any problems you might have. High ticket program's aren't for everyone. Honestly, these are the only cons that I can think of for High Ticket Closer. The program seems to have a lot more pros than it does cons. The Verdict – Do I Recommend High Ticket Closer? I'd like to point out one more time that I'm not an affiliate for High Ticket Closer so I gain nothing by promoting this system. With that said, I would recommend this to some people. Who is High Ticket Closer For? I would say that High Ticket Closer is for people who, first of all, are willing to spend $2495 and are ready to do 7 weeks of pretty intense training and work. I would also say that this program is also not for complete beginners. If you are a beginner then I would definitely suggest going with my #1 recommendation. If you're not interested in signing up to Dan Lok's training. Then check out my #1 recommendation below that's helped me earn over $500,000 in the last 6 months all from my laptop.